Your Royal Berkey Includes: 2 Black Berkey purification elements, 1 priming washer, 2 blocking plugs, and 1 BPA free nylon spigot (see 4th photo), home and backcountry instructions. Included Black Berkey Purification elements last for 22,700 Liters (6,000 Gallons) as a pair, are cleanable, and self-sterilizing. For most families this works out to a 5-6 year lifespan. NOTE: After listening to our customers feedback we highly recommend purchasing an extra set of Black Berkey Purification Elements and using all four together. This makes your unit twice as fast and more convenient. For example, a full 12.3 liter cycle purified takes approximately 5 hours with 2 elements. This is reduced to 2.5 hours with 4 elements. As the water level in the upper chamber declines, the purification rate slows due to less pressure on the elements. Health / Wellness and a Survival tool in one! Read and follow ALL included instructions before setting up your unit. If the lower chamber is full of water, do not add water to the upper chamber or your unit will overflow where the chambers connect. If the lower unit is half full, you may fill the upper chamber half way. 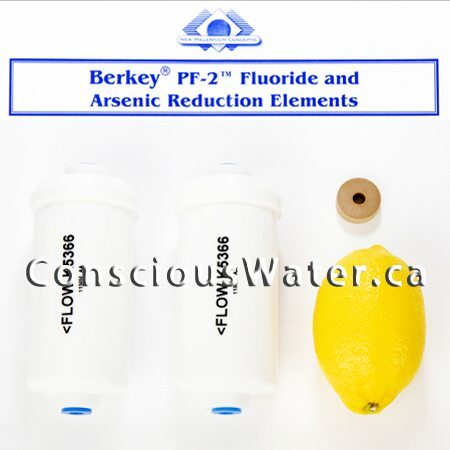 If purchasing the PF-2 Fluoride filters, note they operate in-line with the Black elements. So if you are using 4 Black elements, you require 4 PF-2 Fluoride filters. See this page for pictures to understand better. PF-2 Fluoride filters last for 3,785 liters (1,000 gallons), as a pair. This is about 1 year for most folks. Berkey filters will not purify ocean water and cannot be used with salt-softened water. The difference/improvement in the taste is amazing! This size is perfect for our family. I use the water for all our drinking, cooking, dog dish, and even watering our indoor herb garden. We are so happy knowing that we’re improving the quality of water we’re drinking and feeding our family; and saving money too! Thank you very much Conscious Water! We tried our Royal Berkey out all last week for the first time 1.5 hrs north of Ottawa in the Gatineau mountains! Easy instructions (provided by Berkey and tips provided by Scott). Had to use the water right out of the lake because our pump was broken. The water was green from the lake with all, sorts of pollen and the bass were all around doing their “spring thing”. TOO cold in the water to go out deep so we had to use the green stuff. The water came out crystal clear! Tasted great! Even My hubby who NEVER drinks water was drinking glasses of the stuff. We are enjoying our Royal Berkey water purifier very much! Hadn’t realized how many other tastes were in our water until they disappeared. We keep a cold GLASS pitcher in our fridge all the time and are now drinking far more water than before during this hot summer. We bought a Royal Berkey, and as Scott recommended, we went with 4 Black Berkey elements. Great that Conscious Water includes tips and tricks for Backcountry use as this is for our camp on an island in Lake Huron. Awesome! Reduced water stress at camp to zero. Great product – Improves the taste of our Nottawa water greatly. Not only is our water great tasting and we are enjoying the health benefits from pure water, but Conscious Water is also a great customer friendly store. When putting it together we had a few questions, and received an email reply virtually instantaneously. Great product, great customer service. After an upbeat and extremely knowledgeable customer service experience with Scott, our family purchased a Royal Berkey and can say that it is one of the absolute best investments anyone can make. The product is attractive and of excellent quality. We feel very comfortable in knowing we have the ability to have instant pure clean water at all times. A month ago during an emergency situation our Conscious Water system came through for us with flying colours! To my family this system is priceless! I’ve been very impressed with the Royal Berkey. Great tasting water with a sharp look. Great customer service as well. Scott, you have an absolutely wonderful product!! Our water never tasted better. And it so easy, we don’t need any power. There is always good healthy water available. We have a few Berkey’s in the family. They look great in everyone’s home! Very attractive and practical. I am grateful to having met you and Justyna just over a year ago, for you wonderful friendship and your Berkey’s!! Since I bought the Royal Berkey, my health has improved greatly. It has changed the alkaline balance in my body, as I ward off kidney stones. Thanks Scott! A great little water purifier for our home!! I have reflux problems and acid is the enemy. I needed alkaline water to drink and this little water system works perfectly for me. I feel I’m helping my body to remain more alkaline and thus enjoying more’ internal health’. My husband didn’t like the ‘bland’ taste of the water for the first few days but he is now used to it and enjoys drinking our water too! We give it to our cats as well. LOVE IT!! That’s right I’m leaving a second review! I have used my Berkey for a whole 3 seasons now ,the water still tastes great and runs perfectly clear every time. I was very sad to close up the cottage and leave my Berkey behind …..hmm could it be that I need a Berkey at home too ???!!! Thanks Scott for your very prompt and professional service. Great product with excellent customer service! We were about to order a Berkey 2 years ago from another outlet, then we moved out of town and thought we didn’t need one. Didn’t like the idea or cost of having to change filters often and didn’t want to destroy the pure taste of our creek water – but this year I found a need to add minerals/alkalinity for health reasons. We were going to get a Santevia just for alkalizing – but Conscious Water came up in our search and has such a great comparison chart for overall price with less filter change etc with the Berkey and showed how we can filter our creek water AND add alkalinity for way less hassle and money than we thought. Scott answered questions via email quickly and sent out the order so promptly we were truly amazed. You will need his extra tips for setting up too – we were glad we didn’t buy from the other company. We found the taste still sparkling pure and then we found the Ph had gone from 7.7 to 8.7 immediately! Overall, a very good experience, the Berkey looks “quality” and fits in anywhere. We now don’t have the nagging feelings of “what is in our creek water” either! Watch the video “Why in the World are they Spraying?” and you’ll want a Berkey from Conscious Water fast. Thank-you for your excellent help and products. We have the Royal with two filters. It was easy to set up, filters a full reservoir in about 40 minutes, and one fill is usually enough water for a household of three adults and three small children. It is, in every respect, the best water filtration system we have yet used, and will pay for itself several times over by the time we have to replace the filters. Concious Water provides top-notch service, and no matter how hard I look I can’t find anything to complain about. Amazing! We use our Royal Berkey with City of Toronto tap water and it has made a huge improvement in taste and quality. The whole family is drinking more water and I feel better knowing that we are getting good quality water without any junk. My 2 year old loves being able to easily serve herself and will only drink Berkey water now. Scott did a great job of helping us size the system for our growing family and we received our system within a couple of days of placing the order. I purchased a Royal Berkey for my birthday in May of 2012….what amazing water!!! April….Thanks to my son Tim for selling me on a Berkey and to you Scott. Great product for anyone who enjoys clean water. We bought our Royal Berkey (with the Alkalizing Mineral Stones) last summer and are very happy with it. It is very efficient and easy to use. We like the idea of portability in the event that we will want to use it on trail rides/camping weekends in the future. Scott is very personable and quick to answer any questions or address any problems that may arise. I would recommend this product to anyone who is looking for great tasting water at an affordable price. My wife and I bought the Royal Berkey along with the Alkalizing Mineral Stones and the glass spigot. It does an amazing job at filtering our chlorinated city water. Now that I’m used to drinking the water from our Berkey, I find when I’m pouring the city water in the top, it smells like a swimming pool! I’ve found I’ve needed to back-flush the filters (to keep a steady flow through the filters) twice since buying it about six months ago, but it’s a simple process once you’ve done it once. I’ve told more than one friend to check out Conscious Water’s products – It’s a great water solution. Thanks Scott! We recently purchased the Royal Berkey and we couldn’t be happier!! The Royal works brilliantly! The Berkey has completely enhanced our water consumption as a family. Being a family with two young children we are always trying to model positive and healthy habits, like drinking lots of water. By adding the Berkey to our family, we have found that the children are actually requesting water more often and we even find them helping themselves! We have done taste tests comparing tap water, Brita filtered water and Berkey water and the Berkey water always comes in first!!! I highly recommend the Berkey system, the water truly tastes pure. Scott was excellent in providing us with the necessary information and advice to ensure that our family selected the Berkey that was best suited to our needs. I bought Brita, Aquasana and Santevia but the best is Royal Berkey. Easy to use, treat water fast and the water tastes excellent. Super fast delivery. Easy to put together. I like water cold and my wife likes it room temperature. I put mine in the fridge and she gets hers from the bekley. Excellent water easy to use. Happy with purchase!! LOVE LOVE LOVE my Royal Berkey. Best water filter system on the market. Easy to use, water tastes great and best of all, we can TRAVEL with it. In the last few months our Berkey has come with us for a weekend in Montreal, a trip through the US and camping in Northern Ontario. Easy to take apart, store and set up again in the hotel. I keep telling everyone to get one! the water we where using .we removed them and its working great again!!! I purchased our Berkey back in the spring and love it !!!! It is so nice to have clean, smooth tasting water. I am amazed at the smell of Chlorine from the tap when I fill my reservoir, and that the Berkey cleans it right up, no more smell or taste, and with the alkalizing stones I know I am giving my body the best water I have available. I love the way it breaks down for easy travel. Thank you Scott for the great service and advise, and your consciousness about water. I brought this until to a 3 day outdoor music festival on one of Canada’s gulf islands on the west coast. The only water on site was coming from a creek and there was a sign saying that even if you boiled the water it was not recommended to drink as it contained Giardia and E.Coli. I provided my camp of 5 people along with 3 other camps with water all weekend long and no one got sick. I also tested this unit with a friends stagnant pond water. I filled a bucket with water that was very green with algae and who knows what else and poured it directly into the Berkey. 20 min later we were enjoying fresh clean drinking water. This is hands down the best investment I have ever made, and I cant get over how affordable it is and how long the life of the filters are. When our local health department advised us to put chlorine in our well, we decided that we had better find a healthier alternative. After much research we opted for the Royal Berkey. We use it for our drinking water. We are very happy with the quality and taste of the water, and even happier that we didn’t have to resort to putting toxic chlorine in our well water. We purchased the Royal as we were unsure of the amount of water we would require each day. So glad we did. We fill it daily. Added bonus we also purchased the sight glass spigot. This has been a real time saver as we can see our water level at all times and top up as needed so we never run out of water. Scott has been very helpful with all our water related questions. We also purchased the stones and the floride cartridges. We are very satisfied with our purchase and would recommend this product to anyone concious of what they are putting in their body. The unit itself is very appealing and easily portable. A great buy all around. Yes now this is a water filtration system. There is a bit of a learning curve to get it all set up and once it’s done right you’ll never regret this invesment. When we first moved in to our house in Hamilton, ON we had the water tested. It came back with a higher then normal count for lead and we didn’t want to have our young son drinking the water so we started purchasing large jugs of water from the grocery store. Fast forward 4 years and the birth of our daughter and we were spending a significant amount on water. We purchased the Royal Berkey and haven’t looked back since! The taste different alone between the purchased water (and the calcium buildups in the coffee maker) and the pure filtered water from the Berkey is the same as night and day. Not only is the water better for us but i’m sure the Berkey has paid for itself and then some. Thank you! Scott! This water is fabulous! I knew I would not be disappointed regardless.. but the unexpected benefits are AMAZING! We have very hard tap water and with the Berkey water, water boils 1/3 to 1/2 faster than the hard water, plus it boils differently, gently, and rolling boils for cooking is unreal good, food actually cooks, like chick peas, beans or lentils get mushy and soft in 1/2 of the time. I could boil stuff forever in that hard water and it never really cooks! My tea tastes better, the feel of the Berkey water in my mouth is different, I feel fantastic on it! I have many health issues due to Lupus and every cell in my body feels more ALIVE than ever, all of my senses are enhanced, I have more energy AND I am even sleeping better!!!!! Everyday I feel better and better! 😀 I will be purchasing the shower head soon! Thank you! Thank you. It’s been set up for a couple of days now and my kids love the taste of the water. They also say the container looks cool so they are drinking more water, I’ve noticed. Just thought I would let you know that our family is loving our ”new” water!! It took a few days for me but now I enjoy the taste! I can’t believe the difference. For almost 9 years i have been going to my parents (1/2 km down the road) and bringing back water for my family to drink. I no longer have to do this!! Thanks again for this great product. I will probably be ordering another one soon for my upstairs bathroom. So we’ll probably be in touch soon. Thanks again Scott!! Scott, just wanted to let you know that we kept the Crown at home and took the Imperial to the cottage. Both units are working well and we just love the fact that we do not have to drag the 18L bottles of spring water any more. And that means less energy cleaning, bottling and shipping the spring water bottles – 1 for the Earth, 0 for Waste! Thanks again for being at the Market in Meaford and exposing us to this amazing device! When I was a teenager, I went on an extended canoe trip with the YMCA through Camp Stevens in Northern Ontario. After a very long portage, we left a very polluted water of the Wabagoon River to enter a system of lakes called Twilight, Evening, and Midnight Lakes. it was the pierced water I have ever seen and, even when we paddle out to the center of the lake, we could see clearly to the bottom. It was the freshest water I had ever tasted and I had been inserted that experience ever since. Two years ago, I purchased a Santevia system and, while it was a considerable improvement ovr tap water and Britta systems it still did not have the clear, clean and fresh taste that I had experienced some years ago. I recently purchased a Royal Berkey system and the difference was immediately noticeable. Eyelid and an area where the water is considered generally safe but I have never like the taste. There is no question that Santevia was an improvement but the Berkley system takes me back to back in a trip so many years ago. I just want to say thank you. I used purchase 10 gallons of distilled water per week in plastic jugs that were not refillable. It always seemed like such a waste to put them out for pick up on recycle day and the water always tasted like tin. I chose Berkey because of he long life of the filters and the fact that the system uses no hydro. I could not be happier with my purchase. The water tastes great and as a result we are drinking much more than ever. I probably fill up my Berkey every day and a half on average but sometimes more. Others who have tried the water are now asking me to fill jugs for them and my daughter who is moving out in the fall has asked me to purchase one for her as her “house warming” gift. i would like to tell you that me and my family absolutely love our berkey system. At first, i was highly skeptical about the berkey system. I was looking to buy santevia system, but i discovered about berkey system and made some research on the internet, i couldn’t find anything against berkey system. So i decided to take a leap of faith and decided to make a try. IT’s been almost two months that we use it and are still amaze at how easy it is to use and clean and how great the water taste. Even now, in the eat of summer when our city puts a lot of chlorine in our water system, our water coming from our berkey system taste great. We even add alkalizing mineral stone at the bottom of our system to great alkalinze water. Absolutely the best decision I’ve made for me and my family. We love the Berkey system so much that I recently bought the travel bottles for my wife & kids to use while at work/school. It’s great for our health and the environment. We just can’t ever go back to tap water or bottled water for that matter. Thanks conscious water and keep up the good work! We ordered our first Berkey from Scott about 6 years ago. We started with a Big Berkey and have since upgraded to a Royal Berkey, as our kids have grown older and started drinking much more water. The Royal Berkey is the perfect size for a family of 4. We’ve used the Sport Berkeys while on canoe trips and the kids have loved dipping the bottles into waterfalls, rapids and so many different lakes to see what each of these places “tastes like”. It’s amazing- we used to be so grumpy and dehydrated by about 4pm, because we just didn’t feel like pumping water in the afternoon….but with the ease of dipping a Sport Berkey right into the freshwater alongside the canoe, we drink with confidence all day long and feel so much better. Last year we were in Nicaragua and used our Sport Berkeys as a safe water source. One afternoon I was in a restaurant and asked our server to fill up our Sport Berkey from the tap. He was appalled- “Oh no miss, you can’t drink our water. You’ll get so so sick” he insisted. When I insisted that we’d be safe, then all the staff by the tap watched with amazement as he filled our bottles. And yes indeed- we were safe and we stopped many plastic bottles from be thrown into the garbage for our few weeks in the country. Recently, we were going for a family bike ride and I hastily filled the kids bottles from the hose outside. “Why does my water taste like pool?” our daughter asked when she stopped to take her first chug of water. We’ve become so accustomed to drinking healthy and delicious water…now we really notice when we’re drinking anything that’s not Berkey water. So for years now we’ve been so thrilled with our Berkey water systems- and the customer service from Scott has always been from the heart. He believes in the products and works tirelessly to make Conscious Water the best it can be.